NEW BEDFORD — A 12-year-old boy in New Bedford is getting some extra support in his fight against cancer. 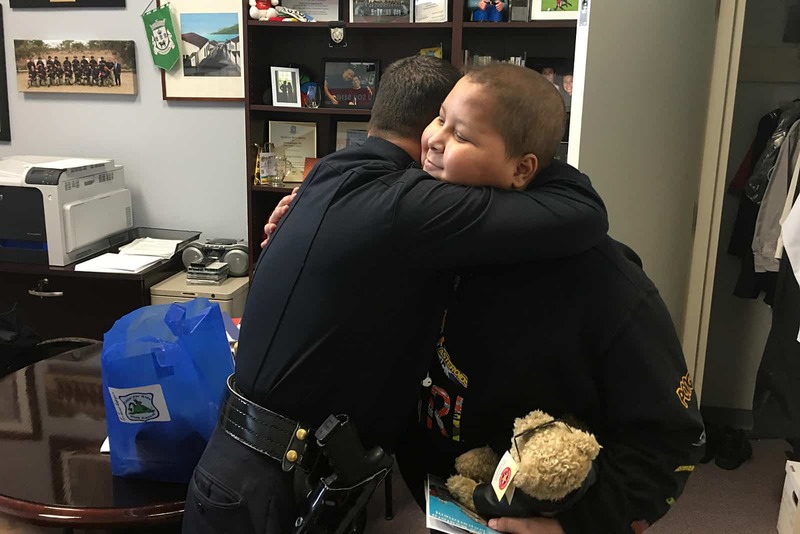 Ty-Jeuvan Rodriquez and his family, Beronica Rodriguez and Diego Morales, received a $5,000 check from Cops for Kids with Cancer during his recent visit to the station. Cops for Kids with Cancer is a 501(c)(3) charitable organization focused on raising funds to provide assistance to families of children fighting cancer to improve their quality of life. The organization was established in 2002 and now has an all-volunteer Board of Directors composed of more than 20 active and retired police officers and friends of law enforcement. The organization presents $5,000 checks to families of children diagnosed with cancer. The families use the donation whatever way they choose. Cancer can take not only a financial toll, but an emotional toll as well. Parents often have to cut back on work hours or quit working entirely or to accompany their children to treatments. Other expenses can include non-covered treatments or medications; travel and parking costs; meals; babysitters and possible home alterations. Cops for Kids with Cancer also gives money to Massachusetts General Hospital and Tufts University pediatric oncology clinic to be used to make a child’s stay there more comfortable when they are being treated for cancer. The money is raised through a range of fund-raisers, including sponsored marathon runners and events hosted by law enforcement agencies. The organization has given to more than 510 families, totaling more than $3.3 million, in and around New England in the past few years.